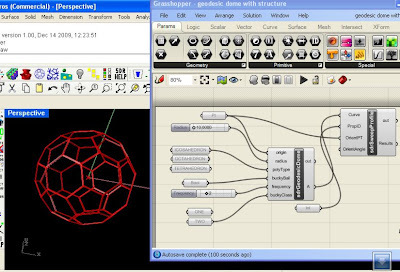 Arthur Mamou-Mani posted on the Grasshopper forum (http://www.grasshopper3d.com/forum/topics/tensile-membrane?commentId=2985220:Comment:54158 ) about tensile membranes and Rhino plug-ins that can compute shapes and forms. I thought the problem looked interesting, and thought I'd see what I could achieve with the new mesh minimal surface tools I've been improving in StructDrawRhino. You need the latest version of BullAnt (http://www.geometrygym.com/downloads ) and a license file, but you can try this for yourself. Note, if you altering the inputs such as the control curves, I'd recommend disabling the Grasshopper meshing component temporarily, and then reconnecting it when you want to recompute. What you find in the basic definition, is that the isolated mesh restraint points produce a very pointed roof, in reality we wish to strength the links along the ridge line. Note that the image shows the mesh baked, which helps identify the isocurves or underlying mesh. Toggling the preview update input can give some insight into how the algorithm is working, at the expense of a slower result. This definition calls on the ggForceDensity Relax functionality to compute a minimal surface discovered by Costa. This command doesn't compute minimal surfaces for all mesh, but at least seems to give a reasonable impression for Costa Minimal Surface. Here's a generic model to also test it. Note, that unless you have a quick computer (or a lot of patience), it's probably worth disconnecting at the Mesh component (or disabling) and previewing the surface if you wish to adjust the sliders for variations. 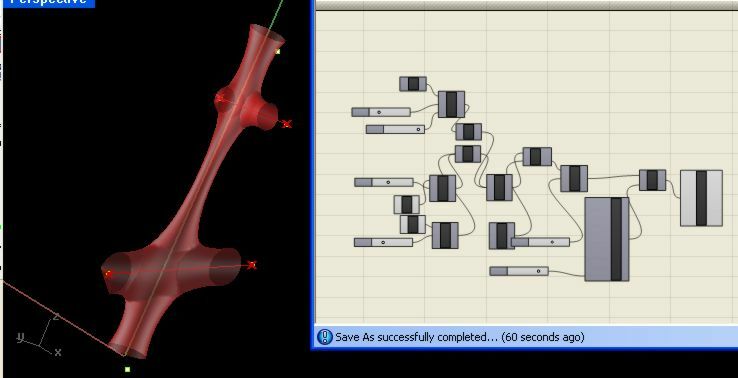 There is also capability to restrain mesh vertex to nominated points, curves and surfaces. Some examples demonstrating this will be posted soon. If you find any unexpected results in your own models, please let me know and I will review them.